Nagoya, Japan – Esters are among the most important classes of compounds in organic chemistry. Simple esters are known for their pleasant, often fruity aromas. Meanwhile, the larger, more complex examples have a wide spectrum of industrial uses, ranging from lenses and moisturizers to "green" fuel (biodiesel). A common way to produce complex esters is to react simpler carboxylic esters with alcohols. Known as trans-esterification, this process typically relies on metal salts as catalysts. However, such catalysts tend to be expensive and/or polluting. Worse still, if the ester is long and flexible, it tends to wrap around the metal center through coordination bonds. By effectively tying up the metal, this "chelation" shuts down the reaction. 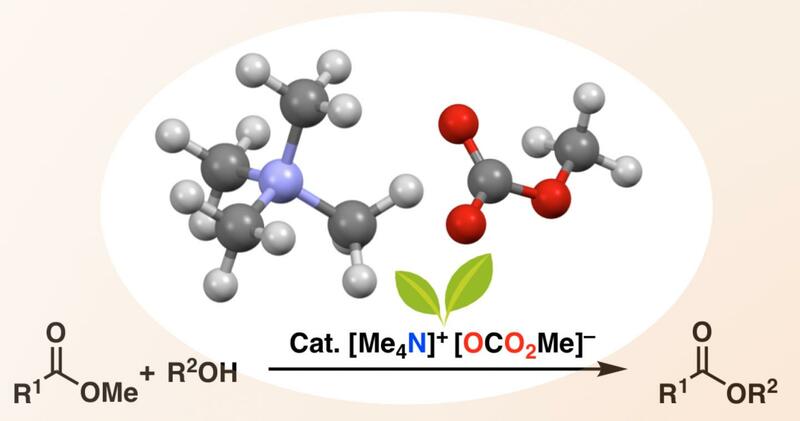 Now, a team at Nagoya University has developed a catalyst that dramatically expands the substrate range of trans-esterification. To avoid chelation, the researchers used a metal-free catalyst, tetramethylammonium methyl carbonate (TMC). Under the right conditions, TMC reacts in-situ with an alcohol to form an alkoxide ion, which then attacks the starting ester to give the complex target ester in high yields. According to Manabu Hatano, co-author of the team's study in Green Chemistry, this is not the first process using alkoxides for trans-esterification, but it is by far the most versatile. "Previous efforts have used phosphonium salts, but the resulting alkoxide can only esterify the solvent itself, which must be dimethyl carbonate (DMC). That's fine if you want a product that can be derived from DMC, but otherwise you need salts that are stable in more conventional solvents. Our new TMC fills that gap." The scope of alcohols and esters that can be combined using TMC is broad indeed. Amino alcohols can take part, even though the amino group would deactivate typical metal catalysts by chelation. A quinine derivative with a 3D bridged ring on the alcohol side was also constructed. Meanwhile, among ester substrates, the esters of chiral amino acids can be successfully reacted, and the purity of the correct enantiomer is safely preserved. Like earlier phosphonium salts, the new catalyst can also be used to esterify the solvent itself, which saves money when the solvent is en route to the target. "Being both recyclable and free of metals, this catalyst is a genuine example of green chemistry," says lead author Kazuaki Ishihara. "Not only is the process itself green, but we can use it to produce green biodiesel, which is a mixture of esters. We synthesized hundreds of grams of a major biodiesel component, which is quite copious for a laboratory-scale reaction. This gives us confidence that the reaction can be scaled up to industrial production." The article, "Metal-free Transesterification Catalyzed by Tetramethylammonium Methyl Carbonate," was published in Green Chemistry at DOI:10.1039/C7GC03858E.